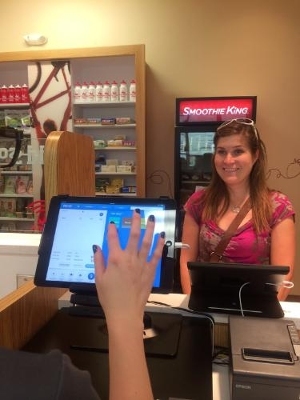 The restaurant industry is making the switch to a tablet as a replacement for their point of sale (POS) systems. The tablet becomes a cash register, menu, and special board among other helpful tools to make a restaurant run more efficiently. The tablet will provide real-time reporting to track sales and inventory. Rather than hiring a back-of-house server, restaurant owners can increase profitability and efficiency through the use of the POS system. Employees will have the ability to use the tablet while working with customers to place orders and then settle the bill. A recent report from Software Advice advises restaurants to tailor their self-service technology towards consumers that are increasingly comfortable using self-service POS systems. The survey found that 47% of consumers prefer to use this technology to customize orders, while 39% prefer to use it to split their bill amongst their dinner companions. Whereas 31% of consumers require the service to use multiple payment methods. An additional 26% of consumers have also claimed that they enjoy the ability to view menu items from the tablet and another 19% prefer checking out the specials and discounts. When it comes to tipping, two-thirds, or 68% of guests said they prefer tipping using the POS technology on a tablet or iPad with 89% rating this method of tipping as either “not at all difficult” or “minimally difficult”. However, allowing customers tight control over their tip remains important. While 66% of the customers prefer to input tips themselves as opposed to having it set by the server. Furthermore, 29% are more likely to leave a tip if they are given the chance to opt-out of doing so. “Data shows that casual and fast casual restaurants are the preferred formats that patrons would want to utilize this technology,” said POS market researcher Justin Guinn of Software Advice. “For fast casual restaurants or QSRs, it’s essential that the menu be easily customizable and clear. For casual restaurants, the staff will need to think about self-service technology more like an ‘assistant’ to the server, as opposed to a replacement. However, even though POS technology has come a long way, restaurant owners would like to see it go even further to solve more of their concerns and streamline their business even more. Restaurants would like to see a POS that can accept new mobile payment options, and one that will also streamline the EMV migration. In fact, both operators and suppliers agree that the ability to accept mobile wallet is having a significant impact on POS software purchasing decisions, closely followed by EMV-readiness and overall payment security. To be more specific, over half of the restaurants say that enabling new payment options such as e-wallet is the top business goal influencing POS upgrades. Adding mobile POS and prepping for EMV is pushing 47% of restaurants to look at POS upgrades. Better integration is a core concern for about a quarter of restaurants striving to build bridges to both e-commerce and other operational systems. The majority of overall POS purchasing activity will be for upgrades to existing POS software, with just over two-thirds of the restaurants that HT surveyed stating their intent to add new functionality, features of modules to their current solution. Some of the specific features restaurants want to come out of this substantial upgrade to their existing systems include the addition of mobile wallet (payment via customers’ mobile devices), tablet-based POS software and loyalty tools, cloud-based POS and even integration with social media activity. Some are even expecting to enter into a Software-as-a-Service (SaaS) relationship with their POS software supplier. This overall push for upgrades to POS systems just reinforces the fact that restaurants want flexibility in the way they take orders and process payments.